STOCKHOLM / ROME, Apr 1 2019 – On March 19, 78 years old Nursultan Äbisjuly Nazarbayev unexpectedly announced his resignation as President of Kazakhstan, referring to the need for “a new generation of leaders”. The same day the speaker of the nation´s parliament was appointed as interim president, awaiting presidential elections scheduled for 2020. Nazarbayev ruled his country for more than a quarter-century and since all influence on public administration rests securely with his Nur Otan Party it will undoubtedly once again win the elections. In 2015, Nazarbayev received 97.8 percent of the presidential votes. Why Nazarbayev resigned is open to speculations, though a common assumption is that he intends to yield power to his eldest daughter, Senator Dariga Nazarbayeva, and by resigning give her time to secure necessary support for a credible victory in the upcoming elections. On March 20, the Kazakh Parliament unanimously decided to change the name of the capital from Astana to Nursultan, to honour the Elbasy, Leader of the Nation, Nursultan Äbisjuly Nazarbayev. The name change has raised questions and worries around the world. Is a name so important? Probably. -stancountry, even if it is in the neighbourhood of and not as stable and wealthy as Kazakhstan. It might be true that Nazarbayev´s assumption is well-founded. Kazakhstan is probably worthy of more global attention. It is the world´s largest landlocked country and the ninth largest in the world. Rich in oil and minerals its economy grows at an average of eight percent a year, making it the first former Soviet Republic to repay all its debts to the International Monetary Fund. In spite of a muffled press and apparent corruption it is according to the World Bank a politically stable country, free of violence. It has furthermore, probably due it is growing wealth, advantageous relations and cooperation with nations as diverse as Russia, USA, Iran, Israel and Ukraine. An ad for The Walt Disney Company once declared: “What’s in a name? Everything!” The name of individuals have become brands, synonymous with either good or evil. The mentioning of names like Hitler or Stalin may evoke fear and dislike, while other names are associated with quality and creativity, like the names of innovators used for prestigious companies – Friedrich Bayer, André-Gustave Citroën, Christian Dior, Gaspare Campari, William Colgate, King Camp Gillette, Soichiro Honda, Will Keith Kellogg, Max Factor, Henri Nestlé, Sakichi Toyoda, Werner von Siemens, Henry E. Steinway, Andreas Stihl, etc. On the contrary to take the name away from someone is a way to obliterate her/him. Names were removed from concentration camp prisoners, they became things and could thus be exploited and annihilated. For example, during World War II, the Imperial Japanese Army’s Unit 731 was engaged in deadly experiments on human beings. Prisoners were injected with pathogenic microbes, exposed to different types of weaponry and subjected to other “experimental” atrocities. Victims were designated with numbers from 101 to 1,500. When all had been killed, the count restarted from 101. They were known as “logs”, maruta and deaths were reported as numbers of “felled logs”. Conquerors have often taken away names of people and the places they inhabit, replacing them with their own. The Philippines are named after Philip II of Spain, while Zimbabwe and Zambia once were named Southern- and Northern Rhodesia after the white supremacist and billionaire Cecil Rhodes, who owned the investment company that controlled these territories. The capital of the Congo Free State carried the name Leopoldville after Leopold II of Belgium, the mass murderer who by foreign nations during the so called Berlin Conference 1885 had been given the immense territory as his personal domain. The capital of the neighbouring country still carries the name Brazzaville after Pierre Savorgnan de Brazza, governor-general of the French Congo. The same is true of countless other places all over the world, renamed after foreign intruders. Catchy and inspiring names may support rise to power. During his election campaign Donald Trump benefitted from the fact that he was not only a person, but a brand as well. The name Trump had become a product projecting what his company, The Trump Organization, wanted to represent – fame, success, glitz, glamour, wealth and power. The success of, or repression by, political leaders is accordingly expressed by their names, their brands. Revolutionary leaders often choose striking sobriquets, like Nguyễn Sinh Cung who chose Ho Chi Minh, He Who Has Been Enlightened, which eventually became the name of a town as well. Ioseb Jughashvili chose Stalin, Man of Steel, and not only Stalingrad was named after him, but towns in all Soviet republics and satellites bore names like Stalino, Stalin, Stalinsi, Stalinogród, Stalinogorsk, Stalinsk, Stalinabad, while other towns were named after his henchmen, like Voroshilov, Kirov, Beria, Molotov and Kalinin. If US citizens are surprised by the impudence of naming towns and capitals after living persons they might be oblivious of the fact that their nation´s capital was named after George Washington while he was still alive. There are even entire countries named after their rulers, like Saudi Arabia, which bears the name of the House of Saud, a dynasty founded in the18th century and still ruling that nation. Names are signs of lasting power. If a ruler was despotic and his name attached to places it is generally taken away after his death. Like the tyrant Trujillo, who for more than thirty years ruled the Dominican Republic as his personal domain and had his nation´s capital and highest peak named after himself. These names were taken away after his death and when his son and heir had fled the country. 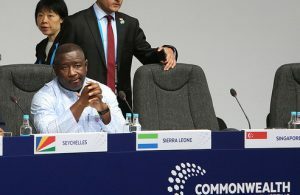 However, Gabon´s capital is still named Bongoville after Omar Bongo, who died as one of the wealthiest heads of state, due to oil revenues and shameless corruption, while his son continues to rule the country. We may hope that the renaming of Astana to Nursultan is not a sign of uncontrolled megalomania, like the one that befell Kazakhstan´s southern neighbour, Turkmenistan, where Saparmurat Atayevich Niyazov, self-appointed Father to the Turkmen, Turkmenbashi, renamed the days of the week and the months of the year after himself and members of his family. He constructed a 120-metre-tall tower, crowned by a gold-plated, revolving sculpture of himself – his face is always directed towards the sun. Niyazov also decided that all libraries outside the capital would be closed, declaring that the only book worth reading was his own Ruhnama; mandatory reading for students, state employees and for those who aspire to obtain a driving license. When Turkmenbashi died in December 2006, he was followed by former dentist Gurbanguly Berdymukhamedov, who named himself Arkadag, the Protector. It is maybe Berdymukhamedov’s odontological background that has made him love whiteness. Dark-coloured cars have since January 2018 been banned from the streets of the capital. Like his predecessor, Berdymukhamedov also likes gold. In 2015 he “humbly accepted” an equestrian monument. 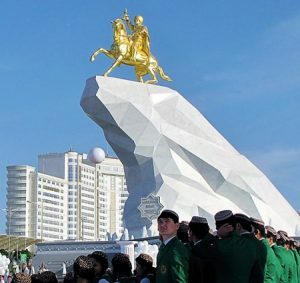 Covered with 24 karats gold Berdymukhamedov is now represented mounted on a horse on top of a 20 metres high, dazzlingly white, marble cliff. In February 2017, Berdymukhamedov was re-elected President of Turkmenistan with 97 percent of the votes in his favour, though his nation´s capital is still named Asischabad. 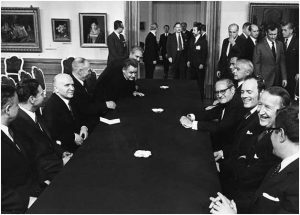 WASHINGTON DC, Apr 1 2019 – Fifty years ago, shortly after the conclusion of the 1968 nuclear Nonproliferation Treaty (NPT), the United States and the Soviet Union launched the Strategic Arms Limitation Talks (SALT).